We’re waxing NASA-talgic in the Monday morning wake of Endeavour’s final launch. 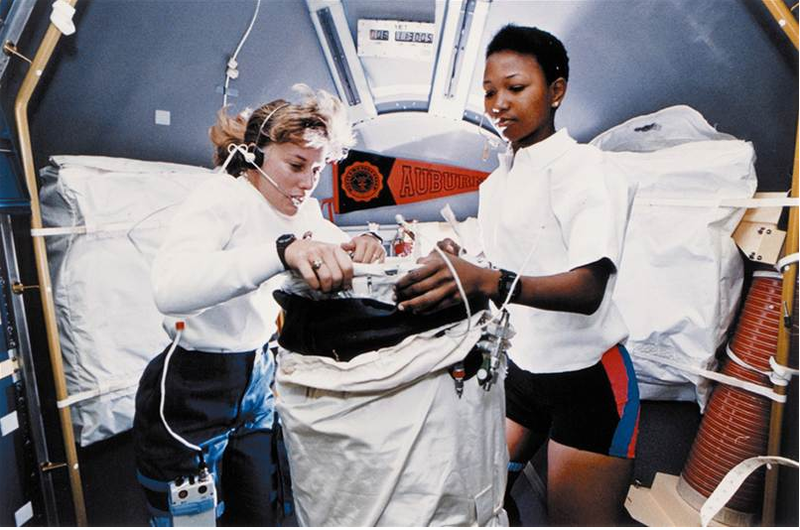 TWER’s favorite Endeavour flight was obviously STS-47 in 1992, and not for the microgravity experiments, but because of the decor brought on board by Mission Specialist 2 Jan Davis (left), the better half of the first married couple aboard a space flight and a 1977 Auburn grad. And also, yeah, because of Mae Jemison’s shorts. Filed Under: Culture, Photo of the Day: Auburn Scenery, Screen Caps, etc. STS-4, the final test flight of the space shuttle system, featured an all-Auburn crew of Ken Mattingly and Hank Hartsfield. I love me some STS-4. #4 was the first shuttle mission with just two crew members, making it 100% Auburn-crewed. It also had the best mission patch. We (being AU) have produced 6 or 7 astronauts to this point. He was briefly Asst. Dean of Aerospace Engr. at AU 2004-2006, or so.